I'm trying to keep it under control. You know, like, not TOTALLY. FREAK. OUT. But I can't help it!!! You see, I've been published! This is rocking my world for several reasons. 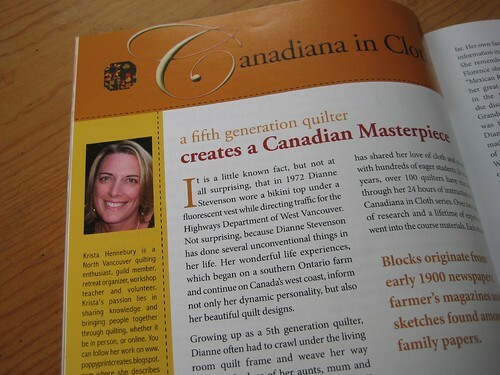 First off, Canada has never had it's very own quilting magazine....until Heather took over a regional newsletter and broadened the whole shebang to a new, glossy, national magazine. Joining forces with the very talented designer Laurraine, these two gals and their many contributors have created an amazing new resource for Canadian quilters. Here's the cover of issue 4 that arrived in my mailbox today. The second reason I'm so thrilled to have an article in the mag is that it's all about an incredible quilt created by my friend and quilting teacher/designer extraordinaire Dianne Stevenson. Dianne has made a beautiful quilt to honor women's work and textile history in our country called "Canadiana in Cloth". Dianne then turned this experience into an 8-month quilting course that is, in my humble opinion, worthy of a university credit in textile history. Thirdly, while I can't re-write the entire article here for you, I can giveaway my extra copy to one lucky Poppyprint reader (and you know I could never send a magazine all by itself - how lonely would that be? - so expect some extra goodies)! 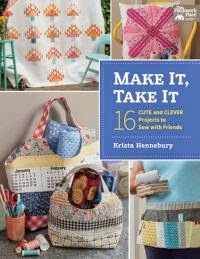 Normally I don't go in for those giveaways with lots of rules, but in this case, I would love to spread the word about Quilter's Connection. If we want a Canadian quilting magazine to succeed, we need to support it, people! So, leave one comment below to enter this giveaway. If you have your own blog, post a link to this page on your blog (feel free to use the cover photo)....then come back and leave a second comment for another chance to win! I'll leave comments open until 9:00 p.m. Pacific Standard Time, June 4 at which time I'll employ the RNG to find the lucky winner. No need to become a follower (honestly, I know there is only so much time in the day for blog-reading! ), but take a look around and if you like what you see, then why not hang out and share the love? I'd be happy to have you follow along! If you live in Canada, you can find Quilter's Connection on the mag rack at Indigo or better yet, subscribe here. If you subscribe, then you will receive the fall issue which just might have another Poppyprint surprise in it....eeeeeeeee! Congratulations, it's a heady feeling isn't it? and a cute photo to boot. I really have to get a subscription to this magazine, our local magazine store doesn't carry it. Remind me again that I need to subscribe. That's awesome! So you wrote the article? You are a woman of many talents. Hi congratulations! So nice we have a Canadian quilting magazine --finally! Sharonj. Congrats to the new Canadian quilt magazine. Wow, that is super exciting! Go you! I would love to read the whole thing! Congrats on being published!!! How exciting! That is just wonderful!! I would love to have a copy of the magazine so that I can read your article. How cool is that? Congrats!! OO! I would love to have the magazine and I will be subscribing! Congratulations on your article. i'm big enough to admit being TOTALLY JEALOUS! wow! that is cool, krista! you are amazing! OMG...I'm SOOOOO proud of you!!!! You must be on the moon! (And rightfully so!) Bravo! No one deserves it more! i've posted your happy news on my blog! so here i am entering your giveaway again! Congratulations! I'd love to win; I always enjoy checking out new magazines, and I doubt this one will be easy to find here in Australia! This is wonderful! I will have to check out the website. Woo hoo!!!! Congratulations. Your work is lovely and deserves to be in print! 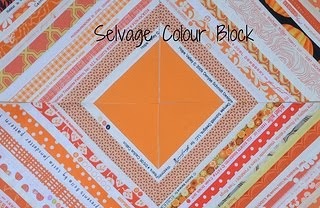 Absolutely adore your cover quilt!! Congratulations! How exciting! Congratulations! I am so happy for you - you so deserve it. I was lucky enough to hear Heather speak at our local quilt guild. We Canadians are very proud of one another's accomplishment especially if there is a quilter involved right! Congrats on your accomplishments! What to go! Sure hope the magazine makes it to the USA...will look for it, but in the mean time sure would like to win it. 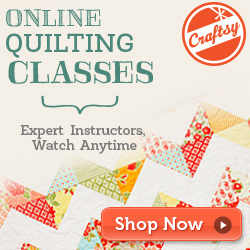 New to your site and Paulette from Sweet P and quilting, really special lady from your Canada. I would love to win that magazine, don't have it here in the midwest.. Will be checking back with you and put you on my sidebar.. I'm a Canadian and love to see a Canadian quilt magazine. Haven't seen it at my local bookstore. Is it only available at Indigo's? Would love a chance to win a copy. Yeah Canada! Congratulations Krista and thanks for a chance to win a copy of this great CANADIAN magazine. I've posted you on my sidebar. Thanks again. Paulette sent me and I'm so glad she did! Congratualtions to Canada for publishing what looks like a fantastic magazine and to you for being in it!! Congrats on being published! How exciting for you. I haven't heard about nor seen this magazine on our newsstands but I'll certainly keep my eye out starting now! Congratulations! Isn't it great to have a magazine all about Canadian quilting? Wonderful! And congratulations! If I don't win yours, I'll be going down to my local Indigo and looking for this! Cheers from Kingston, ON! Oh, how exciting!! Congratulations!! :) I follow Sweet P's blog and she was spreading the great news!! I would love to check this magazine out! Thanks for the chance! Krista - congratulations - I'm already subscribed to Quilter's Connection and love it - so happy to see Canada's quilters honored and showcased. 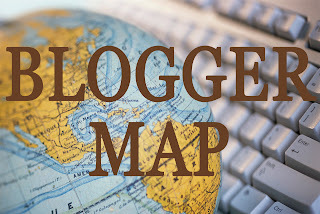 Just found your blog through another blogger and am excited to be another follower. Can't wait to get my copy and read your article! If you're posting overseas, I would love to have a copy of Quilter's Connection. The front cover is so inviting! Congratulations Krista! I am sure this is just the first of many articles and patterns to come. I can't wait for my copy to arrive in the mail. What could be better than a cup of tea and time to read an article by one of my favourite people about one of my favourite teachers...YAY!!! Krista, I loved, Loved, LOVED your article on Dianne's "Canadiana in Cloth"! Of course I was so excited to be only the second person to read it, so everyone can be jealous of me! And the photos you took for the spread are fabulous! I finally had the opportunity to meet Dianne at Quilt Canada in Calgary last month, and I can see why you two are friends - she's as wonderful as you are! Congratulations on being published. I am so happy we have our own magazine. I have yet to find this Canadian magazine but I will keep my eye out for it. Congratulations on being published in it. I will try and post about it tomorrow. Congratulations to you for the article and all Canadian quilters for having their own quilting magazine. Hopefully, it will be distributed here in the US. Oh Congratulations! That is wonderful and a wonderful article. I would love to win a copy! Thanks for the chance! Much continued success! Congratulations on your article being published! Thanks for the chance to win a copy of the magazine! Link now posted on my blog, thanks for the use of your photo. That is so awesome! What an honour! I wish that I could get the magazine, but I am proud of you! Wow, thanks for the giveaway! I enjoy your energy and enthusiasm so much. It inspires me to get back on the machine and make something really cool. Felicitations Krista!!! I am subscribing now! Can't wait to receive my copy. I will try to get your issue on my travels this summer, no Indigo in Kitimat! Michelle P.
That is so cool! Congratulations! I hope I win so I can read the whole article! Krista, Thank you for the chance to win a copy of the magazine so I can check out the whole article. Love quilting and love Dianne's work. I started to read the article from your photo above and it really drew me in allready... such a shame I cannot read on! Congratulations on getting published! Back again for my second comment. I just had to share your lovely news. Congrats on the magazine article!!!! Thrilling! I'd love to read this issue. I'll look for it on the magazine racks, but not sure I can get it here in Atlanta. Would love to win a copy! Congrats on the magazine article :) You are so clever and I have seen the launch of this magazine...well from a distance as I am in Australia. I would love a copy of the magazine as it looks fabulous. Terrific news! 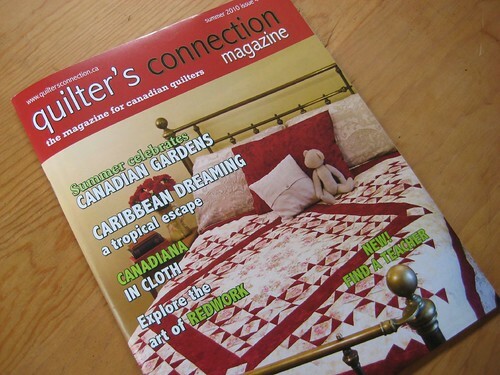 Great to hear about the new Canadian Quilters magazine. Congratulations, Krista. I'm proud of you! I wish, I could buy the magazine. Cool. Congratulations on being published! We have to keep the love of quilting going - spreading the news, teaching others. I have a 9-year-old grand daughter that is working on her first quilt with me - just a little wall hanging for her Mom's birthday and she is doing it by hand. It is touching this Grandma's heart to see those little fingers work. So proud of her. congrats on the article. I hope my copy is in my mail box tomorrow!! congratulations on being published, the magazine looks nice *_* when i'm back in canada i'll pick up a copy. Congrats on the new mag!! Oh my goodness, how exciting for you to be published. Congratulations on your article and best wishes for the continued success of Quilter's Connection magazine. I'd love to get my hands on your new mag, it looks beautiful. Do you know, will QC make it to the states? Congratulations! I'd like to enter if you are taking international entries. Congratulations to both you and Dianne. I know her from FVQG and have had the opportunity of taking one of her classes. She is a great instructor. Congratulations on being published! Hope it will be distributed in the US. Congratulations, Krista! This is totally amazing and well deserved!! !